Aqaba’s future doesn’t just lie in luxury lifestyle projects. Companies like PBI Aqaba are fast molding the Red Sea port into a major center for manufacturing, logistics, and storage services. Aqaba’s glamorous leisure and tourism projects are naturally more adept at catching the headlines than their industrial counterparts. But in terms of expanding the development zone’s economy, it’s the firms that cluster around Aqaba’s port that are arguably doing most of the heavy lifting at the moment in terms of creating jobs and attracting foreign direct investment. One of these firms is PBI Aqaba, which started operations in 2005. The partnership of British, US, and Turkish investors runs a vast, industrial estate that comprises everything from storage areas for Korean cars, to factories that manufacture armored vehicles. Most of the activity is export-orientated, which illustrates just how important Aqaba is as a gateway for surrounding markets. 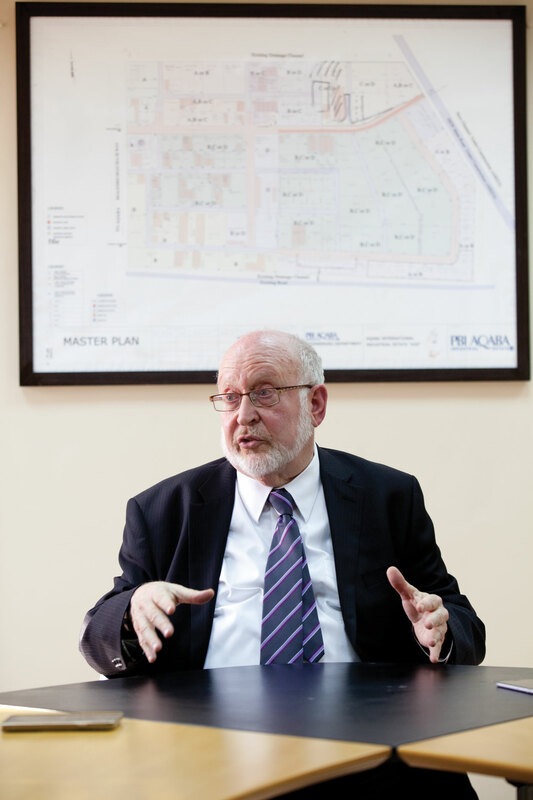 Sheldon Fink, PBI Aqaba’s American CEO, said industrial projects are now finally gaining the recognition they deserve for adding real value to Aqaba’s economy. How much demand has there been for your services? In 10 years we sold or leased about 800,000 square meters of land. About half of that is built up and operating, and the rest is either in the process of being developed or has been placed in reserve by existing companies to expand at a later time. We have around another 600,000 square meters of land here which we will be marketing over the next three to four years. After that, we have no more land in this area. But we have already signed an MOU with Aqaba Development Corporation to get another 1 million square meters near the new port development in the south. How are you contributing to Jordan’s economy? We have about 1,000 people working here. When we’re fully developed here, there will be about 2,500. Then in the south at our second planned site, there will eventually be another 2,500. To date, there’s about $300 million invested here. When it’s finished there will be about $600 million. The south will be about another $600 million. In 2014, there was JD153 million value added here. Under ASEZA law, we’re allowed to have 70 percent foreign workers and 30 percent Jordanian. Actually, 65 percent of our workforce is Jordanian. The government of Jordan hasn’t invested any money, but they’ve taken out about $30 million in participation of profits that we have paid, and additional tens of millions of dollars in taxes that the different companies present here have paid. We have between 80 and 90 clients. Some have as little as 100 square meters and some have as much as 50,000 square meters. The largest companies work in metals engineering, such as one that’s been operating for five years and makes big components for electrical power stations or chemical plants, boilers, smoke stacks and bridges to carry heavy cranes. There’s also a large company that will start operating in February that will make aluminum wires and powders, in addition to other industrial products. It will be a first for Jordan. We have some plastic companies, some food companies. A private Canadian company also makes armored cars here for export. For the past year we’ve tried to become active in solar energy and LED lighting. We’ve signed some agreements with some Chinese and American companies to help them develop a market here and then they will move part of their manufacturing here. In 2016 and 2017 we think most of the expansion will be Chinese. In 2015, most of the expansion was from Syrian and Libyan companies. Up until now, we are developing and selling around 80 to 90 square meters a year. If the Chinese project succeeds, we will go to about 150,000 square meters. How has the role of your sector changed down the years? When we started here 12 years ago, if you asked the government what Aqaba was supposed to become, the answer was Sharm el-Sheikh. We said no, it should become an Izmir, Haifa, or Genoa. What’s the difference? The difference is the port. Izmir, Haifa, and Genoa are also tourist cities, but they don’t live from tourism, they live from their ports. The ports mean industry and logistics. So our position was that more emphasis should be put on the subject of the development of the port and the industrial logistics companies in Aqaba and in Jordan. For may be two years now, that view has been accepted. The realization was that that was a better model. The proof of this: We invested $300 million and we created 1,000 jobs. There are projects in Aqaba for $3 and $4 billion that don’t create 1,000 jobs. So an effective way for a country which doesn’t have so much money to develop is through light and medium industries, and logistics, which create more jobs per dollar invested and more value added to the economy per dollar invested than real estate, tourism, or the other choices. So the model of Aqaba should be a model where the port and the support industries and companies are the lead, and the tourism is also here. There are many cities which have this model. I think we helped by advocating this approach and showing that you could succeed using it.